If you learn piano chords you have found an easy and quick way to play! Read a short introduction about chords and how you can use them when learning to play the piano! When you learn chords, you learn one of the most important elements of music; Harmony. Harmony is created when two or more notes are played at the same time. If you can read music notes already, learning more about chords and chord progressions will help you to understand better how a composition is structured. Knowing chords will help you learning new pieces; and it will even make it easier to memorize them later. If you are just starting to learn the piano, you could even start to learn piano chords by ear or with some easy lead sheets, and then continue learning to read music notes. But, note readers or not- playing chords is simply fun and easy to do! OK. Now you know how to play a major and a minor chord. That's all you need to get started actually. Learning to play from a lead sheet. Play chords by making up your own that fit the melody. Of course, as you play chord piano you will probably do a little bit of both. Keep reading as I will show you how. A lead sheet is sheet music with only lyrics and chord symbols, or as above; the melody of the song plus lyrics and chord symbols. There is no written accompaniment; this is what you have to "make up" on your own with the chords given. You can start by playing the melody in your right hand. With your left hand you'll play the chords in either major or minor as indicated on the lead sheet. The chord symbols are rather easy to understand. The letter name tells you the lowest note of the chord (in root position). The other two notes you add on "top", spaced a third apart, but those are only indicated in the chord symbol with an "m" or "min" after the letter for a minor chord. The major chord has no indication. The C minor chord is written "Cm" or "Cmin", and played like this. Easy! Any other numbers or symbols added to the chord marking are coloring the chord with other notes added to the chord, or removed from the chord. But this is not necessary for beginners, really. You could start playing with chords just using the simple major and minor chords. Of course this is a compromise in sound, but it's still a rewarding way to get started! This way of playing got nick-named “faking” an accompaniment, and gave rise to so called "Fake Books". Fake Books are collections of music, melody, lyrics and chord symbols now available in many different styles and genres. Very famous are also the “The Real Books”, (love the name!). Most known for being a collection of Jazz standards, there are now many, many different books and styles in the "Real Book" collection. There are also great Fake ( or Real ) books for beginners! 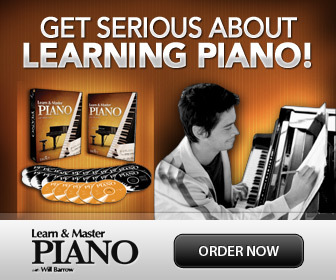 If you are just starting out to learn piano chords, I recommend that you get for example The Easy Fake Book (Amazon). Tune up your singing voice and accompany yourself with simple, easy chords- and you’ll be the star of the party in no time! Play piano by ear is what you do when you pick out music you’ve heard without the help of sheet music. You can do the same with chords. Play a melody you have picked out, and with the left hand you try different chord combinations that fit to the melody. There is no right or wrong way to learn this, and trial and error will also improve your aural skills (! ), so don’t fear mistakes. It will also help to learn a bit about chord theory and how to read chord symbols.